From the French version on El Perseguidor, allegedly Cortázar's favorite short story. Found in Paris. 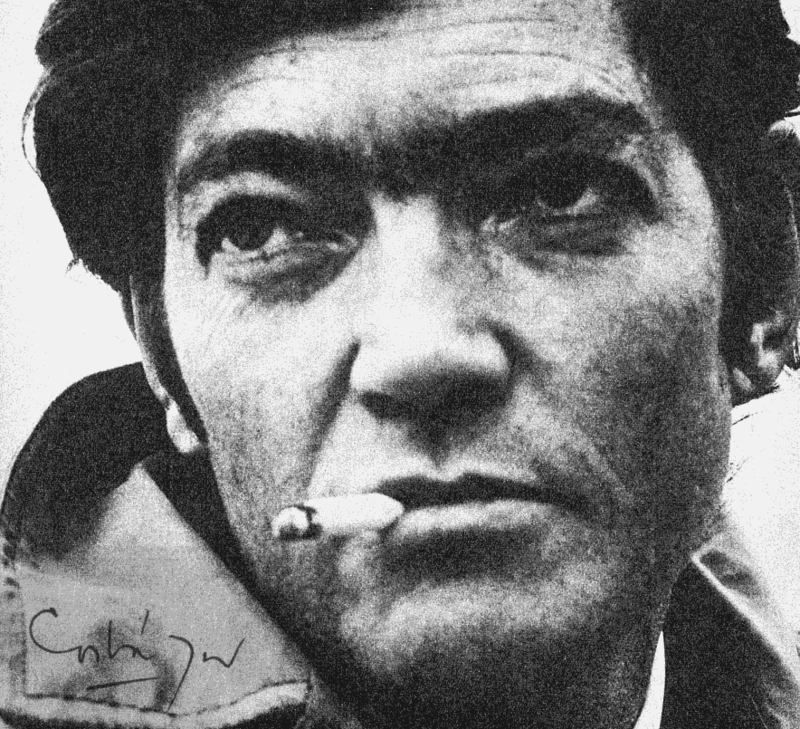 Yesterday was the 100th anniversary of the birth of Julio Cortázar, one of my favorite authors and I think one of my favorite people too. All social networks were flooded by images of his life and his universe, of links to articles, quotes and photos. Not very often being bombarded by an ton of copy/pasted words feels this good. In this case it did. I love to think about all this people all over the world thinking of him, remembering his words and looking for the right quote to share. Thousands of people, silly like esperanzas, with the technique of a fama (or a librarian, which I'm sure more often than not, people mistake one for the other), and of course the determined enthusiasm of a cronopio that wants to pay a little homage to the biggest cronopio of all. I visited Cortázar in the Montparnasse cemetery a couple of days ago. This is something I like to do when I go to Paris. Is not about looking at his tomb and the little rocks that people put on top, along with letters, metro tickets and dry flowers. It's about the ritual. It's about walking around his neighborhood trying to recognize what is left of the Paris that he showed to me, the first Paris I ever met. If is not at the Cemetery, I take a minute to go to Saint Germain Des Pres and visit the Old Navy, an easy-to-overlook café he used to write in, or wander around the Quartier Latin, thinking of the Serpent Club or Charlie Parker, or walk along the Rue Cambronne, close to where he shared an apartment with the eternal Maga. Cortázar is still very present in my mental map of Paris. Probably because in Paris I'm a tourist and all the streets and the metro and the little corner cafes are not poluted with too much reality. Paris is still a dream for me and Cortazar his wonderful narrator. I am currently reading Rayuela in English. The book was a birthday present from my beloved friend Marie which waited quietly until it was meant to be read. I think now is the perfect time for reason that I am not even going to try to explain, because as Julio said, somewhere there is a rubbish bin where all the explanations rest. "The same thing happens to everybody, the statue of Janus is a useful waste, the truth is that after forty years of age we have our real face on the back of our heads, looking desperately backwards. It is what in all truth is called a commonplace. You can't do anything about it, that's about the strenght of it, with the words that come twisting out from between the bored lips of one-faced adolescents. Surrounded by boys in baggy sweaters and delightfully funky girls in the smoke of the cafés-crème of Saint-Germain-des-Prés who read Durrell, Beauvoir, Duras, Douassot, Queneau, Sarraute, here I am a Frenchified Argentinian (horror of horrors), already beyond the adolescent vogue, the cool, with an Etes-vous fous? of René Crevel anachronistically in my hands, with the whole body of surrealism in my memory, with the mark of Antonin Artaud in my pelvis, with the Ionisations of Edgard Varèse in my ears, with Picasso in my eyes (but I seem to be a Mondrian, at least that's what I've been told). "Tu sèmes des syllabes pour récolter des étoiles," Crevel kids me. "One does what he can," I answer. "And that female, n'arrêtera-t-elle donc pas de socouer l'arbre à sanglots?" "You're unfair," I tell him. "She's just crying a little bit, it's little more than a complaint." It is sad to reach the point in life where it's easier to open a book to page 96 and converse with the author, from café to grave, from boredom to suicide, while at the tables around people are talking about Algeria, Adenauer, Mijanou, Bardot, Guy Trébert, Sidney Bechet, Michel Butor, Nabokov, Zao-Wu-Ki, Luison Bobet, and in my country the boys do talk, what do the boys talk about in my country? I don't know any more, I'm so far away..."
A couple of articles, one in El Mundo (España): 100 años del cronopio mayor and another one in El País: Cortázar forastero.